We are thrilled to have been named 2017 Expat Tax Provider of the Year for the Asia Pacific region last week in Hong Kong. The new award follows our also having been named 2017 Expat Tax Provider of the Year for the Americas region in Denver in May. This time we came in ahead of global accounting giant EY (formerly Ernst and Young) as well as several expat tax services specialists. 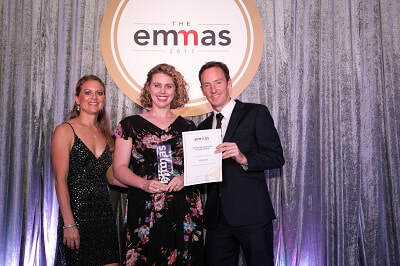 The EMMA awards are arranged by the Forum for Expat Management, the online and real-world community for the global mobility and expat services industries. The EMMA awards celebrate excellence in these fields. But exactly how are we dominating our field this year globally, beating ‘big 4’ accounting firms, and leaving our competitors in our wake? The answer is that we have been busy transforming the experience of filing US taxes from abroad to make it simpler for our expat clients through innovation. For example, we created our recently-introduced secure online client tax organizer from the ground up to make providing the information required for tax returns much easier for our expat clients, who live in over 150 countries around the world. In 2017 we have also introduced a mobile app offering our clients the ability to communicate with their CPA and to securely scan and upload documents from their phone or tablet. No other US expat tax providers currently offer the innovations. But as well as employing technology in ground breaking ways to make the process of filing US taxes from overseas easier, we also understand the importance of a human connection for our clients. For this reason we have structured our business to ensure that our clients always have a single point of contact, someone who is readily available for them should they have any queries or concerns. Other expat tax firms on the other hand require clients (once they have signed up) to submit a general contact form if they have a question and then wait up to several days (in peak times) for a reply. Our latest win was announced at a glamorous gala dinner at the Harbour Grand Hotel in Hong Kong last week. Gregory Dewald, lifelong entrepreneur, Bright!Tax founder and CEO, and the brains behind Bright!Tax’s rapid ascent has fostered a culture of enterprise, innovation, and thought-leading forward motion which has resulted in the firm’s meteoric growth.